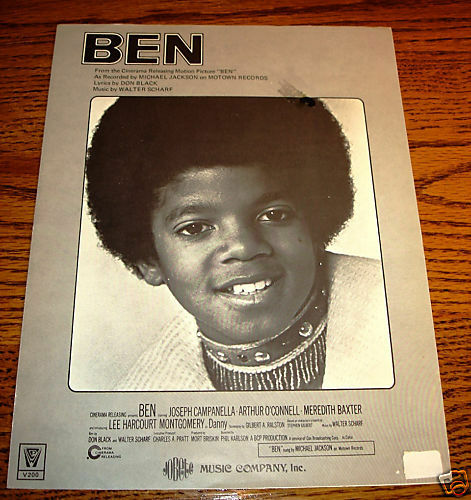 Thissale is for a Michael Jackson Original Sheet Music from the motion picture "BEN" recorded by Michael Jackson on Motown Records. Lyrics by Don Black. Copyright 1971 1972 by Jobete Music Company. There are 3 pages of lyrics and music. This sheet music has no writing or tears. The original price is on the back showing 1.25. This sheet music is in near mint condition. PLEASE SEE THE OTHER GREAT ITEMS I HAVE IN MY STORE! INTERNATIONAL BUYERS WELCOME - Email Me For Shipping Charges!